Governor Theodore Orji of Abia State, on Monday, said the proposed Umuahia Airport and a seaport would be constructed through the Public-Private-Partnership (PPP) initiative. Orji made the disclosure in Umuahia while fielding questions from newsmen after presenting the state's 2014 Appropriation Bill to the House of Assembly. 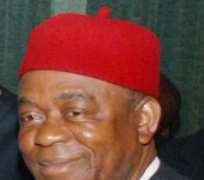 The lawmakers had asked Orji to explain how the government intended to fund the projects, as they were not captured in the budget estimates. He said the state government would partner with investors who indicated interest to partner with it. He added that the process of funding the projects would be articulated in the memorandum of understanding to be signed between the government and the investors. “My intention is just to start the projects. I will not tell you that I must complete them because they are capital intensive but the two projects are vital to the economy of the state and I know that the incoming government will not abandon them. The governor expressed the hope that the N149.6 billion appropriation would be given accelerated passage by the legislature.